On 9/11, Marian Osher's flight from Amsterdam to the US was detoured to Halifax, Canada. She was afraid to fly for three years. Her in-flight fascination with the textures and abstractions of the earth and clouds inspired her to create colorful mixed-media paintings and wall hangings that helped her to overcome her fear of flying. Fearless Flying in 2016! coincides with the commemoration of the 15th year since the tragedy of 9/11. About the Artist: Marian Osher had double vision until she had an eye operation at the age of four. With “new eyes” she delighted in a world of vision where she could see the single shapes of all things. And then she began to draw. "That was probably the beginning of becoming an artist. Processing and transforming what I see, and sharing what it means to me through my art helps define who I am." “As I continue to evolve as a person, my art is like a river running through my life, taking new directions, influenced and inspired by my life’s experiences. I feel that art has helped me to become a more spiritual person, enabling me to feel the connection that we have with each other and with all of nature." Marian Osher is a painter, printmaker, mixed-media artist, private art instructor and art consultant. She enjoys working at her studios in Maryland and near the Delaware seashore. Fearless Flying! 2016 is her 23rd solo show. She has had 6 solo shows in New York. Her artwork has been shown in numerous group exhibitions in the U.S., as well as international shows in Argentina, Australia, Belgium, Brazil, India, Italy, Moscow, and Shanghai. 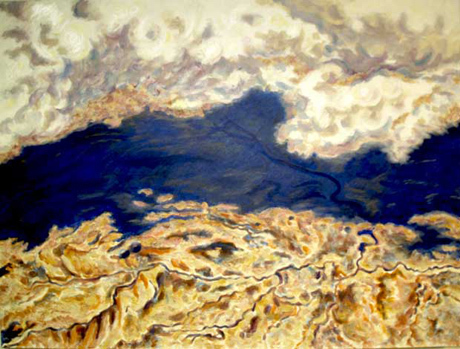 Her work is included in the permanent collections of the Library of Congress, National Museum of Women in the Arts, the Museum of Modern Art (Buenos Aires, Argentina), and the American Cultural Center (New Delhi, India). She is included in the Green Art Guide and the Women Environmental Art Directory. Osher was featured as a Spotlight Artist by the NY Examiner in 2016. Current gallery affiliations include the Ceres Gallery (NYC), Gallery 50 Contemporary Art (DE), Blank Slate Gallery (FL) and the Washington Printmakers Gallery (DC). She studied art at GWU (MFA), University of MD (BA), and took numerous art courses at Montgomery College in MD.